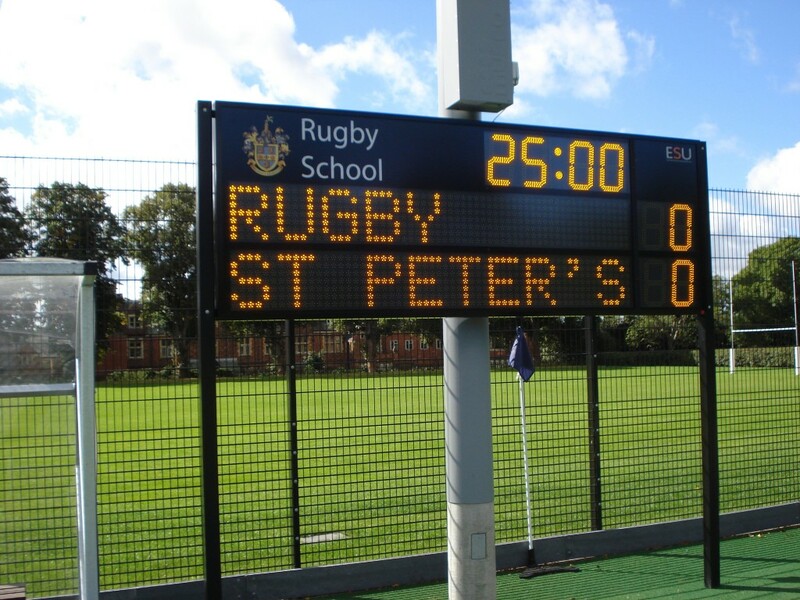 When the existing hockey scoreboards from another supplier failed to perform to their expectations Rugby School turned to ESU to provide a professional solution. Three new custom designed scoreboards were constructed in powder coated aluminium enclosures with anti glare polycarbonate fronts having vinyl applied internally to include the school crest and name. With 10 off 300mm alphanumeric characters for each team name and 8 high brightness 300mm digits for the scores and timer, the scoreboards can be seen at a distance of more than 180m. A key requirement was ease of operation which is provided by the hand held radio remote control which not only changes the score and controls the timer but allows easy selection of up to 30 team names stored within the scoreboard. The list of team names is easily updated by using a USB pen drive and is a great improvement on the old boards which had an unreliable WiFi connection to control them. ESU have been making scoreboards for three decades and have an enviable reputation for quality and service. We have in house engineering facilities to customise existing products or produce completely bespoke scoreboards. Contact us now to discuss your requirements.